What is the Best GoPro Compatible Full Face Snorkel Mask? We updated our list of gopro compatible full face snorkel masks on the market in 2019. What are Different Types of Snorkels? How Does a Full Face Snorkel Mask Work? Can I Breathe Underwater with a Snorkel Mask? How Deep Can I Dive? What if I Need Corrective Lenses for Snorkeling? How Do I Snorkel with a Full face Snorkel Mask? How to Use a Full Face Snorkel Mask? How do the straps work? Made by Wildhorn Outfitters the Seaview is one of the most popular full face snorkeling masks around in 2019. Like most full face masks, one of the major attractions of this model is the 180-degree field of vision which the Seaview model sports. It also features a dry snorkel to keep unwanted water out of the mask. The Seaview mask makes sure it won't fog up on the user, as it diverts exhaled air away from the lens. While anti-fog will do the same job, this saves an extra step before you hit the water. The manufacturer also recommends that you breathe through your nose to further prevent fogging. 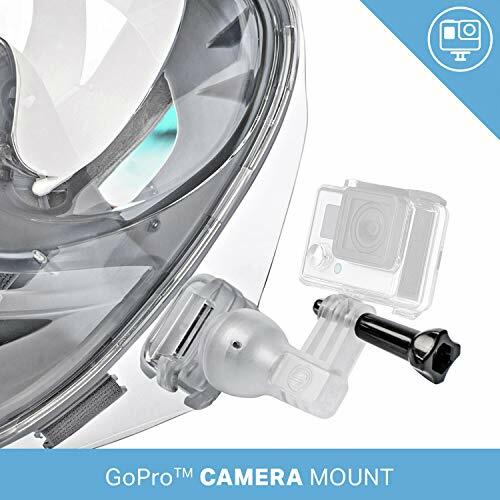 Seaview has also included a GoPro mount (and here is an up-to-date list of gopro alternative action cameras in case you want to go for less expensive brands) for snorkeling on the front for hands-free underwater filming. The mount is integrated, so be warned that you cannot detach it. They also throw in a free tote bag, just in case you don't already have one. The mask also sports a one-way chin valve so that if water ever leaks into the mask, you simply lift your head out of the water to let it drain. This model is available in a plethora of different colors, so you can personalize your mask. You can choose from; navy blue/gray, aqua, electric, lotus, manta ray, plum/gray, sky, sunset, white/blue and white/teal. The snorkeler who just can't get into the water without their GoPro as this model features an integrated mount. The fact it is available in so many different colors will also attract fashionable snorkelers. The Tribord Easybreath has been around since 2014 when their parent company Subea first offered its creation to the public. It is regarded as the very first full face snorkel mask. Another model which can boast a 180-degree field of view for the user, which is far greater than a traditional snorkeling mask. The dry snorkel is a bit different than the others on this list, as it comes with an added safety feature (for snorkeling safety - check our blog post about snorkel vests here). In addition to keeping the water out, this snorkel has a bright orange streak manufactured into the top. This makes you easy to see for a lifeguard, family member or safety crew. Any water that makes it into your full face snorkel mask will be easily drained with the valve, located near the chin. Simply lift your head up out of the water to let any water out of the mask. Fogging won’t be an issue, especially if you breathe through your nose. A separate breathing chamber allows air to flow away from the lens, preventing fogging without the use of anti-fogging spray. Tribord also offers more sizes than their competition. Customers can choose from one of four sizes, compared to three from most manufacturers. The Tribord Easybreath is available in many colors, depending on your preference. You can buy it in; atoll, blue, pink, coral lace, orange, fish turquoise and turquoise whales. Unfortunately, there is not a GoPro mount on this mask, so video-addicts should be warned. The snorkeler who knows just how important it is to be seen as it sports a brightly-colored snorkel. Four different sizes also makes it perfect for the snorkeler who always seems to fall between sizes. H2O is a company based in Hawaii, so they know all about underwater sports. Their Ninja features the 180-degree field of vision demanded by consumers. The dry snorkel which allows users to breathe while snorkeling also keeps water out of the mask. Air circulates away from the user's face, meaning anti fog is only optional. Especially while breathing through the nose, the Ninja reduces fogging by up to 90% compared to a traditional mask. 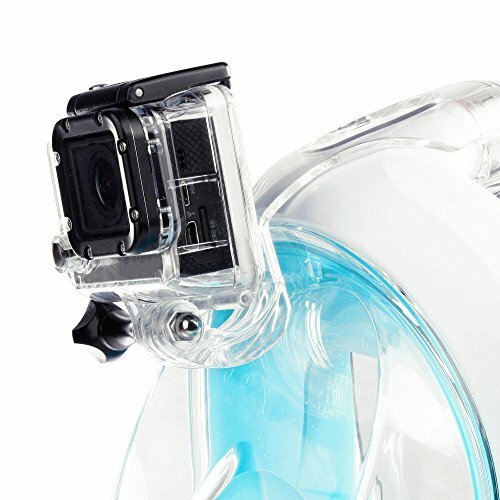 H2O gives the consumer an optional GoPro head mount. This attachment, once engaged, would allow you to film your whole snorkeling excursion without lifting a finger. Please note that it does require slightly more assembly than the other masks. The free tote bag is an added bonus in the box. A one-way valve at the chin will assure that any water entering the mask can be drained by simply raising your head out of the water. Customers can choose between; blue, black, green and pink. Please note that the colors, aside from black, are featured as tint on the lens and does not reflect the color of the frame. The snorkeler who is just starting out and doesn't really know if they want to use a GoPro on every single excursion. The fact the H2O mount is detachable makes it slightly more customizable. A snorkel is basically just a hollow tube which is held in the mouth and extends above the surface when the user's face is in the water. This allows the user to breathe while underwater. This is the oldest version of recreational snorkels and the simplest in design. The unit looks like the letter 'J' and features no space-age accessories or gadgets. If the user finds that some water has entered into the unit, they will have to remove it via displacement. Purge snorkels look a lot like J-tube snorkels, but with one big difference. There is a purge valve near the mouthpiece, at what may be thought of as the 'bottom' of the snorkel. This allows the snorkeler to blow any water which has made its way into the unit back out, allowing for easy breathing. These are a sort of hybrid between purge and dry snorkels. The semi-dry snorkel features a purge valve, but also has what may be thought of as a 'splash guard'. Essentially, this is a small hood which covers part of the top, the part of the snorkel which breaches the surface, which is helpful in choppy conditions. ​Dry snorkels feature a bobber mechanism at the top of the snorkel. This mechanism will remain open as long as the snorkeler is at the surface, however will close when the user dives under the waves. When the bobber closes, it keeps water out of the snorkel, eliminating the need to either displace or blast water out of the unit. These are the latest, greatest variant of snorkels available to consumers. A full face snorkel mask covers not just the eyes and nose of a user, like traditional masks do, but the entire face. This gives an unparalleled 180-degree view to the snorkeler. The user will also be able to breathe through both their mouth and nose, unlike any other snorkel available. Most, if not all, full face snorkel masks also feature a bobber mechanism, making clearing the tube a thing of the past. Like other masks, a full face snorkel mask creates its seal using a silicone skirt which rests on the user's face. Unlike traditional snorkeling or scuba diving masks, these cover not only the eyes and nose but the entirety of the user's face. Silicone is used as it is a very supple material, meaning it will conform to a face very easily. It is also a rugged material and masks with silicone skirts last much longer than those made from plastics. So long as you have the correct size mask for your face, it will create a natural seal around your face. This means no adjusting; just put the mask on and you're ready to snorkel. A full face snorkel mask uses tempered glass for the lens. This is the same type of glass used in passenger vehicle windows, mobile phone cases and screen protectors and even bullet-proof glass. Simply put, manufacturers use quality materials. The final component of a full face snorkel mask is the snorkel. It is permanently mounted onto the unit on the top of the unit, near the user's forehead. This ensures it is always in the correct position for snorkeling. The snorkels used feature a bobbing mechanism, just like dry snorkels, meaning that after diving, the mask and snorkel will not flood with water. The fact that the user's entire face is sealed also means that they could breathe either through their nose or mouth. Sadly, the answer is no. Once you dive down and submerge the full face snorkel mask, you will not be able to breathe. You would not, however, get a face and mouth full of water. The bobbing mechanism inside the snorkel does not store any additional air, it only keeps water out. So, once you submerge the snorkel, you will have to hold your breath. There is, for certified scuba divers, a similar product called a full face diving mask. This product replaces the regulator a diver would usually use; however, a full face snorkeling mask is not a like-for-like replacement. The large lens of full face snorkel masks are great because they allow a 180-degree field of view for the user. However, with more surface area on the mask itself, there is also more air inside the mask. The more air between your face and the lens, the more pressure you will feel while diving down. The deeper below the surface the user travels, the greater the pressure acting on their body. Therefore, manufacturers recommend that users dive no deeper than 10 or 15 feet. Otherwise, the snorkeler may begin to feel discomfort from the increasing pressure. Users will also note that it is very difficult to equalize their sinuses while using a full face snorkel mask. Most snorkelers equalize by squeezing their nose and gently exhaling, however due to the design of these masks, there is no way to reach the nose while in use. Some people are able to equalize by either moving their jaws while descending or simply by swallowing. These techniques are not as effective as squeezing the nose and exhaling and not everyone will find be able to equalize this way. Just like with the air between the mask lens and the snorkeler's face, the air inside the user's sinuses would be affected by the growing pressure underwater. If you cannot equalize without pinching your nose, please do not dive down more than a few feet with a full face snorkel mask. A lot of snorkelers and scuba divers have questions about corrective lenses. Mostly, they think that not having perfect 20/20 vision precludes them from underwater sports. However, this is not the case. -Contact lenses can easily be used while underwater, with or without a full face snorkel mask. So long as your mask fits your face snugly, there is no reason to worry about your contact lenses. The only worry would be if the mask gets flooded and the user opens their eyes, allowing their lenses to float out. The silicone skirt featured on all quality snorkeling and diving masks will make sure this will not happen in normal circumstances. Unless you willingly take your mask off or flood the mask at depth, your contact lenses will be perfectly safe. -Glasses are a bit trickier. Since the frames on a pair of glasses would wrap around the user's ears, they cannot be used on a mask, full face or otherwise. This is because the frames would break the seal, or in other words, would not allow a seal to be made on your face. Therefore, corrective lenses may be required. However, keep in mind that the water will naturally refract light, making objects slightly easier to see under the surface. Some users will, therefore, not need corrective lenses for their mask, as they may be able to see well enough without them. If you can, try your new full face snorkel mask in a pool before hitting the beach. If natural refraction is not enough for you, however, there are options available. A few manufacturers have begun either building their products with corrective lenses already installed or with optional optical attachments. For example, Ocean Reef makes a product called 'Optical Lenses' which fits inside its Aria full face mask snorkel. These are plastic glasses frames that lenses are inserted into by an optical professional and fit snugly inside of the mask. -Finish Assembly. Most full face masks will not be fully assembled upon purchase/delivery. Perhaps if you buy from a brick and mortar store the employees will finish this task but, if not, you will have to do it. Your mask will come with an instructional manual detailing the steps. Usually, you just need to put the snorkel assembly on the top of the mask. -Pre-treat (optional). If you are already an avid snorkeler/scuba diver this step will sound familiar. Masks are prone to fogging right out of the box, although full face snorkel masks are in general less likely to fog. If you desire, you can treat the lenses before use with toothpaste. Simply apply liberally and rub the toothpaste in with your fingers. After treatment, your mask will not fog. -Adjust. You will need to adjust the straps on your new mask before first use. The user's manual will explain in detail but begin by fully loosening the straps. Then, place the mask on your face, pull the straps snugly to your head, keeping them as even as possible. The mask should not be 'squeezed' onto your head, just fit snugly enough that it will not fall off your head at the surface. Remember that it is water pressure that should hold a mask in place, not tight straps. Otherwise, you will experience discomfort underwater. -Enjoy. Now, your mask is fully assembled, won't fog and is perfectly fit for your body. Time to go have fun! For people who have been snorkeling for years this may seem like something out of Star Trek! If you have never snorkeled before this can be a great option to jump in and get going without any learning curve. Please take a few more minutes to read about the below. 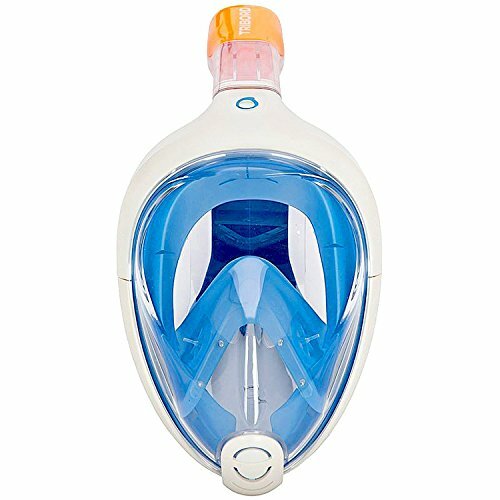 The snorkel sits on top of your forehead attached to the mask and when your head is in the water it pokes up top so you can breathe comfortably and easily. On most full face masks they are more visible and sometimes even 4 x more than regular snorkel's when you are snorkeling in the sea. Most of them have a splash guard which stops water from entering your mouthpiece and taking on water while you are snorkeling. It's a small piece of plastic (usually) that flips back and forth so when water goes over your head and around the snorkel it prevents the water from entering. A very simple, easy feature that makes snorkeling even more enjoyable when you don't have to worry about swallowing water and focus on the sea! All of the straps are going to be adjustable and some come in different motions such as an X shape across the back of your head and some will have 2 straps that go lateral with one coming from the mid line of your head to stay in proper position. Mostly made of a nylon or water proof material so it is very comfortable and easy to use. If you do have a smaller face and need to tighten the straps up most of them will come with additional loops so you don't have the straps floating around in the water distracting you. You can just put the straps through the extra loops and away you go. Just like with most snorkel mask, some will have an additional spot for an underwater camera. Make sure that your camera is compatible with your full face mask. Most GoPro cameras and some other brands similar to GoPro's will work just make sure they do first before you go spend a lot of money on a camera and mask they are not compatible. Most masks will specify how the sizing chart works depending on the brand and company. 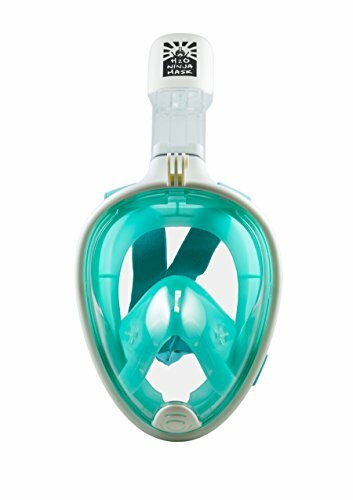 I have shown a size chart for Seaview but most full face masks will show exactly what to measure and how. It is very simple and easy to do so not worry that you won't get the right fit. Now, because of the trending masks, customers can buy just one piece of equipment and get the added benefit of a 180-degree field of vision. However, there are still a lot of questions out there regarding these 21st-century gadgets (see this recent video by CBS news diving into safety of snorkeling masks). While futuristic, full face snorkel masks are functional enough to satisfy even seasoned water sports enthusiasts. Meanwhile, they also make the sport much easier for beginners. Features like the pure silicone skirt, dry snorkel and one-way drainage valves mean that you only need to know the basics of snorkeling to have a great time. All you need to do is just add water!